^ "Fellows' Guide to Christ's College". Christ's College. Retrieved 8 October 2015. Anthony Watson (died 10 September 1605) was an English bishop. Charles Anthony Swainson (1820–1887) was an English theologian, Norrisian and subsequently Lady Margaret's Professor of Divinity, Master of Christ's College, Cambridge and a canon of Chichester. His published works deal mainly with the Eastern Liturgies and the Creeds. Christ's College Boat Club is the rowing club for members of Christ's College, Cambridge. It inhabits the oldest wooden framed boathouse on the river, the nearest to Jesus Lock. Christ's has taken women's headship once during the 2015 Lent Bumps. Edward Hawford D.D. (died 1582) was an English churchman and academic, Master of Christ's College, Cambridge from 1559. While Hawford was a somewhat conservative and administrative-minded academic politician head of house, no friend of religious enthusiasm and suspected of covert Catholicism. Christ's became a Puritan centre under his mastership. George Henry Rooke, D.D. (3 August 1702 – 7 February 1754) was a priest and academic in the eighteenth century.Rooke was born in Carlisle. He was educated at Christ's College, Cambridge, graduating B.A. in 1725 and MA in 1728. He became Fellow of Christ's in 1727; and was Master from 1745 until his death. He was Vice-Chancellor of the University of Cambridge from 1745 to 1746. He held livings in Cambridge, Great Eversden, Little Abington, Foxton, Hadstock and Great Horkesley. Irven David Edwards (19 November 1907 – 14 February 1973) was an Anglican priest in the mid 20th century.Edwards was born at Stretton, East Staffordshire, the son of John Edwards, at one time a prebendary of Lichfield Cathedral, and his wife Beatrice. He was educated at Repton School and Christ's College, Cambridge. Ordained in 1935 he began his ordained ministry as chaplain of Christ's College, Cambridge. He was also general secretary of the Advisory Council for Training for the Ministry from 1935 to 1944. In 1940, he became rector of Milton, Hampshire and in 1947 vicar of Norton, County Durham. He became vicar of All Saints's Leicester and Archdeacon of Leicester in 1956. In 1963 he was appointed Dean of Wells, a position he held until his death in 1973.In 1938, Edwards married Diana Vernon Douglas Crick, the daughter of Douglas Crick, Bishop of Chester. The Rev James Cartmell, D.D. (13 November 1810– 23 January 1887) was Master of Christ's College, Cambridge from 1849 to 1881.He went to Carlisle Grammar School, after which he spent the rest of his life at Christ's. He was successively undergraduate, fellow and tutor before his long mastership. John Covel (2 April 1638 – 19 December 1722) was a clergyman and scientist who became Master of Christ's College, Cambridge and vice-chancellor of the University.John Covel was born at Horningsheath, Suffolk, the son of William Covel. 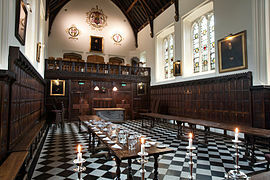 He was educated at Bury St Edmunds school and Christ's College, Cambridge, where he was made a fellow in 1659. In 1670 he went to Constantinople as Chaplain to the Levant Company. For a time he was in sole charge of the embassy there. He travelled widely in Asia Minor and described the buildings and plants which he saw. He purchased a lot of Greek manuscripts (including codices 65, 110, 321, 322, and ℓ 150). After his return and a period as Chaplain to the Princess of Orange in The Hague (1681-1685), he was elected the 15th Master of Christ's in 1688, a position he held until 1723. In his later years he developed the study of fossils. The Rev. John Graham (23 February 1794, Durham – 15 June 1865, Chester) was an English churchman and academic. He was master of Christ's College, Cambridge from 1830 to 1848 and Bishop of Chester from 1848 to 1865. Graham died at the Bishop's Palace, Chester, on 15 June 1865, and was buried in Chester cemetery on 20 June 1865. He tutored Charles Darwin at Cambridge from 1829 to 1830. John Kaye (27 December 1783, Hammersmith – 18 February 1853, Riseholme, Lincolnshire) was an English churchman. John Peile (24 April 1838 – 9 October 1910) was an English philologist. John Watson , D.D. was a priest and academic in the late fifteenth and early sixteenth centuries.Watson was educated at Christ's College, Cambridge, graduating B.A. in 1498; MA in 1501; and B.D. in 1513. He held livings at Elsworth, White Notley and St Mary Woolnoth in the City of London. He was Fellow of Christ's from 1501 to 1516; andMaster of Christ's from 1517 to 1531. He was twice Vice Chancellor of the University of Cambridge: from 1518 to 1520, and from 1530 to 1532.He died in March 1537. Thomas Bainbrigg (Bainbridge) (died 1646) was an English college head. Thomas Chapman (1717–1760) was an English churchman and academic, Master of Magdalene College, Cambridge from 1746. Valentine Cary (died 1626) (alias Carey, erroneously Carew), was an English clergyman, who became Bishop of Exeter. Walter Curle (or Curll; 1575 – 1647) was an English bishop, a close supporter of William Laud. Born in Hatfield, Hertfordshire, he was educated at St Albans School and at Christ's College, Cambridge (matriculated c. 1592), transferring to Peterhouse (BA c. 1595; MA in 1598), of which college he later was elected Fellow.He was bishop of Winchester from 1632 to 1647. When in 1645 Parliamentary forces under Oliver Cromwell captured Winchester, he went into exile at Soberton.He was bishop of Rochester in 1628, and bishop of Bath and Wells from 1629 to 1632. His translation caused the vacancy as Rector of Bemerton that gave the poet George Herbert a living there. He was Dean of Lichfield 1622 to 1628. Curll's son Walter Curll was created a baronet in 1678 (see Curll baronets).